Using compelling images in your emails, blog posts, pins, Facebook status updates and, of course, on Instagram is crucial in these image-centric times. But how can you set your pictures apart from the millions of other photos out there? Here are five photo apps that’ll make your pictures pop and impress your audience. 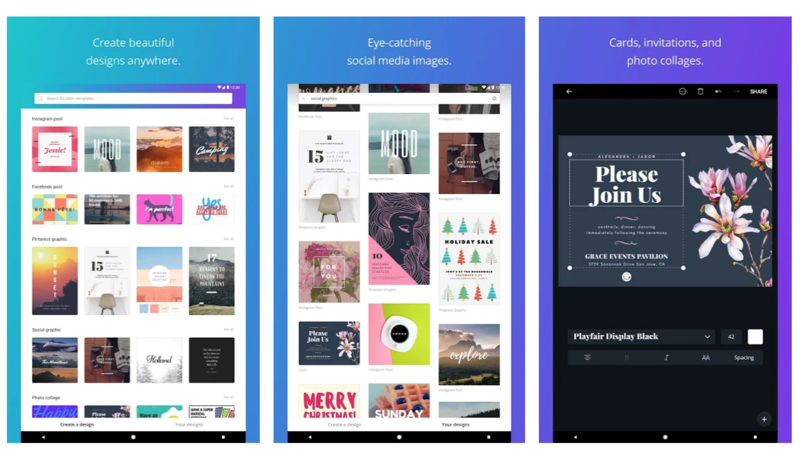 Canva has quickly become one of the most popular graphic design tools out there. The free app enables non-designers to create professional-looking work on the go. It features templates for practically every platform, including Facebook covers, Instagram story highlights, Twitter posts, infographics and YouTube art. If you want even more options, hop over to your desktop and visit the Canva website where you’ll also see templates for everything from e-book covers to gift certificates. With several different artistic fonts, Canva is perfect for putting text overlays on images. To create your design, upload images from your photo library or choose from more than 1 million stock images and icons, many of which are free. Diptic allows you to edit and mash up photos and videos to create incredible collages. They can then be quickly shared on your social networks including Instagram, Facebook, Twitter, Flickr and Tumblr. The editing functions include more than 60 layouts for up to nine photos in one collage, text captions, 14 different filters, and the ability to round the borders with distinctive textures. You get all this functionality for $2.99, and you can purchase new texture packs and video watermark removal in-app for an additional 99 cents. Image credit: Pocket Pixel Inc. Using your finger to highlight the areas you’d like to add a “splash” of color to, the 99-cent Color Splash app lets you effortlessly bring a dramatic look to your photos. By switching the photo to black and white through a filter, you have the ability to “brush of” the drab and highlight the color of the original photo. This focuses the attention of your audience on that particular piece of the photo. This specific app is not available for Android. However, there are three free similar apps that do work for Android devices: Color Splash FX, Color Splash Effect and Color Touch Effects. This $2.99 photo app is a must for anyone who wants to add cool lighting effects to their Instagram pictures. With the ability to choose from four different lighting effects, including Bokeh, LensFlares, Light Leaks and Spotlights, your friends will think you’re moonlighting as a professional photographer. In addition to the above-mentioned effects, you can further customize your photos using the provided lens textures. Boasting tools that are comparable to what you would find with pricier software like Adobe Lightroom, this free photo-editing app can make smartphone images taken even in bad lighting look great. Use the healing brush to remove unwanted spots, image tuner to adjust exposure and color, crop tool to adjust size, and the selective “control point” tool to enhance isolated areas of the photo. Want to get a little more creative? Try the lens blur, glamour glow or double exposure features. 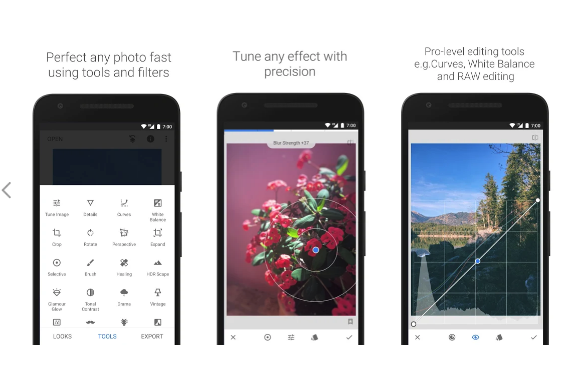 Snapseed also boasts an exciting lineup of photo filters to give lackluster pictures that extra oomph. The best thing about all of these apps is that they allow amateur photographers to create polished, striking photographs. But before you start posting your creations to your social accounts or adding them to your emails, think about your brand’s personality. Color Splash, for example, may result in a gorgeous image, but you’ll have to decide whether that image is a good fit for your brand. To find the right app or combination of apps for your company, take some time to experiment with the tools and ask friends, family and business partners what they think about your photos. Editor’s note: This article was originally published in January 2013 and has been updated for accuracy and relevance.